A quick look at the Next Coin Market cryptocurrency broker reveals that it is a scam that you should avoid. Next Coin Market will allegedly allow you to trade with cryptocurrencies like bitcoin, XRP, ether or bitcoin cash. The broker provides bonuses on deposits and trading signals. But don’t dare to think that you could make money with it. We found two red flags and proofs that Next Coin Market is a scam. On the Next Coin Market’s website you can find statistics about what the broker allegedly achieved in 2017. 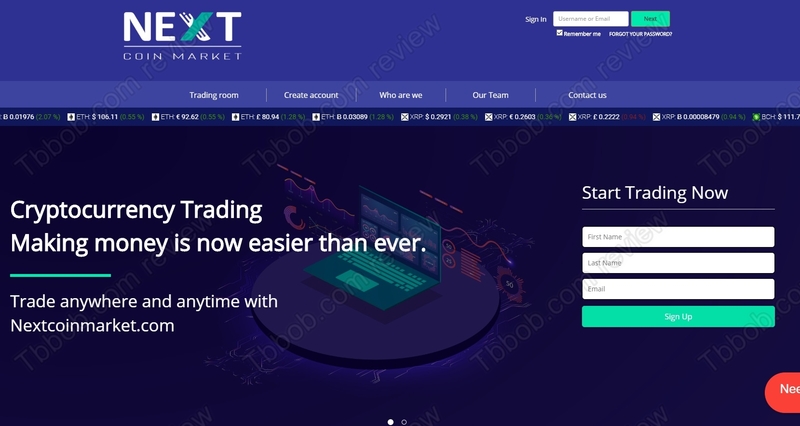 More than one hundred thousand customers, millions of trades etc. But they are clearly fake. Because the nextcoinmarket.com domain was registered only at the end of November 2017, it is impossible for these numbers to be real. No broker can ever get a hundred thousand customers in one month, especially not during December. Next Coin Market also present some allegedly loyal customers who endorse the company. But these reviews are fake. Photos were stolen on the internet and the testimonials fabricated. People on those photos are not real clients. Next Coin Market is providing false information and fake testimonials, therefore it is a scam. Stay away from it. If you want to trade with cryptocurrencies, try it first on a free demo with a regulated broker.